We have a keen and friendly band of ringers, with a wide range of ages and experience. 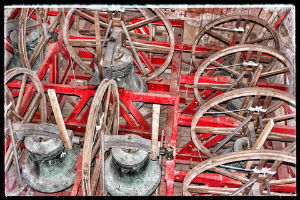 Bells have been calling the people of Bletchingley to worship for about 300 years. We ring the bells before the main Sunday services (9.15-9.45am), for special occasions such as weddings, and for Surrey Association training events. A single bell is chimed for 5 to 10 mins before the 8am service on Sunday mornings and occasional midweek services. We practice every Wednesday evening (7.30-9.15pm). The dates of weddings, training events etc can be found on the Parish Diary. Anyone can learn to be a bell ringer and we always welcome visitors, whether you are an experienced ringer, are interested in becoming a bell ringer, or just want to find out more about the bells and how they are rung. Although the bells are high up in the church tower, we ring them from the ground floor and we can even show you the bells as they rotate, on closed circuit TV. Ringing on the ground floor enables our ringers to feel that they are an active part of the Church. Do come in and see us, through the big old tower door at the West end of the church, on any Wednesday evening. The current bells date back to 1780 and Bletchingley is slightly unusual in having as many as ten bells – a fitting number for what was once a market town with two members of parliament! Our bells are one of the finest rings of ten bells in Surrey. The original eight bells were cast in 1780 by Thomas Janaway of Chelsea. Five of them were subsequently recast by Mears and Stainbank (Whitechapel) in 1912 and two more were added as part of the major restoration in 1991. When they are being rung, each bell turns an almost complete circle every time it strikes. Ringing is suitable for anyone from the age of around 11 and over. Once the basic rope handling is mastered, practice enables a ringer to become more confident and gain great satisfaction from ringing. You don’t have to be a believer or a church-goer – but many of our ringers are! The Bletchingley Ringers are members of The Surrey Association of Church Bell Rringers. Their website has much more information about bells and bell ringing in Surrey.